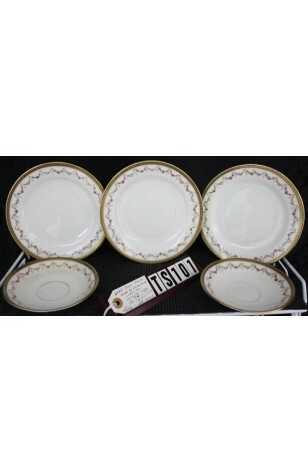 Antique - Court China by William Lowe, Pattern 5634, 5-pieces includes 2-Saucers and 3-Tea Plates, Made from 1912 thru 1930. Court China Tea Plates and Saucers in the Pattern #5634 by William Low of Longton, England. These Tea Plates and Saucers are White with a Greek Key & Dot Border in Gilt, with Pink Rose Garlands, and Swags on Plate Lips. Saucers have 22kt Gold Verges, and the Tea Plate Verges do show some wear of the 22kt Gold. A Lovely Old Pattern which would look great with Solid Color Cups. Court China Tea Plates and Saucers in the Pattern #5634 by William Low of Longton, England. These Tea Plates and Saucers are White with a Greek Key & Dot Border in Gilt, with Pink Rose Garlands, and Swags on Plate Lips. Saucers have 22kt Gold Verges, and the Tea Plate Verges do show some wear of the 22kt Gold. A Lovely Old Pattern which would look great with Solid Color Cups. Very Good Resale Condition unless noted below or in pictures. 2 - Saucers - 5 3/8"